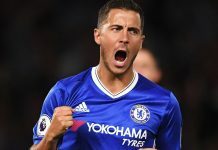 After Tottenham Hotspur halted Chelsea’s run of 13 consecutive victories on Wednesday night, questions were asked about how this Chelsea side would respond to that defeat. 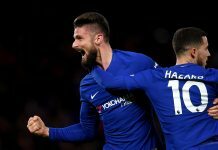 On Sunday afternoon, the Blues put in a professional performance at Stamford Bridge, defeating Peterborough United 4-1 in the FA Cup third round. Granted, Chelsea’s opponents are a League One side and the Blues would expect to win, but matches against teams like Peterborough can be tricky if the Premier League leaders didn’t focus on the task at hand. Fortunately, there was no upset to be seen, as a brace from Pedro and goals from Michy Batshuayi and Willian consigned the visitors to defeat, and despite the fact that John Terry was shown a straight red after the hour-mark, Chelsea can at least claim to be back to their winning ways. Chelsea manager Antonio Conte decided to evaluate some his squad members, handing starts to Batshuayi and Ruben Loftus-Cheek, who have both been linked with loan moves in this transfer window, and recalling Branislav Ivanovic and John Terry. Kurt Zouma made his first start since his terrible injury last April, and Nathaniel Chalobah also made a rare starting appearance. Peterborough manager Grant McCann vowed to attack the home side, and just eight minutes in, it almost paid off. Marcus Maddison was given a bit too much space to curl in a cross towards the back post. Lee Angol escaped the attention of Kurt Zouma, but he scuffed his volley right into the waiting arms of Asmir Begovic. The Posh continued to look to get the ball forward in attack, but Chelsea’s quality on the counter attack proved to be a bit too much for the visitors. On 18 minutes, the Blues took the lead when Willian led a counter attack down the right that eventually led to a 30-yard shot from Chalobah that Luke McGee could only parry in the path of Pedro. The Spaniard took a touch inside the defender before blasting a shot from about six yards out into the top corner to give the Blues the 1-0 advantage. Pedro should have made it 2-0 on the half-hour mark when Willian, who tormented the visitors’ defence all day, sent Loftus-Cheek free down the center with a clever ball. Loftus-Cheek’s initial shot was saved, but when the rebound came back to him, Loftus-Cheek rolled the ball to the late-arriving Pedro, who again cut inside his defender and thundered his shot off the crossbar. Batshuayi was making just his fourth start for Chelsea since his move from Marseille and was clearly keen to impress his manager with a goal. But at times in the first half, he often opted to go for goal rather than taking a better option. Just before half-time, Batshuayi drew the anger of Conte for failing to spot the run of Willian on another Chelsea counter attack, instead delaying and looking for a shot that was eventually charged down and blocked. He did, however, get his goal and Chelsea’s second just before the break when Peterborough again left themselves exposed to the Chelsea counter, with Willian this time playing in Ivanovic to lead a 4-on-2 break. Loftus-Cheek cushioned Ivanovic’s cross towards Batshuayi, and the Belgian lashed the ball past McGee. Willian added Chelsea’s third just after the restart when Pedro controlled a trademark pass from Cesc Fabregas to find Willian just outside the area. Willian cut inside his defender and then steered his shot past McGee at the far post. But Peterborough weren’t about to give up. Just minutes after Chelsea’s third, the Posh broke from a Chelsea corner, with Maddison flicking the ball past Pedro to race clear behind the Blues’ backline. His cross into the area was poor, and it allowed Chalobah to make up ground and clear. Just after the half-hour mark, John Terry was shown a straight red for denying a goal-scoring opportunity when he went to ground and impeded Angol as he was racing in on goal. The Blues gave possession away just on the edge of the Peterborough penalty area, and Zouma failed to cut out Chris Forrester’s past for Angol. 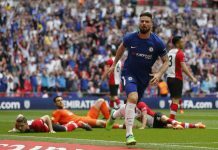 Angol took a touch to take the ball wide of a sprawling Terry, and the Chelsea captain was adjudged to have fouled the striker and sent on his way. Peterborough got their goal just three minutes later when another Maddison cross caused havoc in the Chelsea penalty area, with Angol eventually flicking the ball to Tom Nichols to tap in at the far post. It proved to be just a consolation, as Pedro would get his brace and Chelsea’s fourth after a little one-two with Batshuayi gave him space to shoot, and he skillfully guided another shot past McGee to seal the Chelsea victory.